Today we went to a winery that I hadn't been to before: Wild Sun Winery in Hillsboro, Missouri. I finagled our way into a stranger's game of bags. Lydia lost a no-smiling contest. Sad. 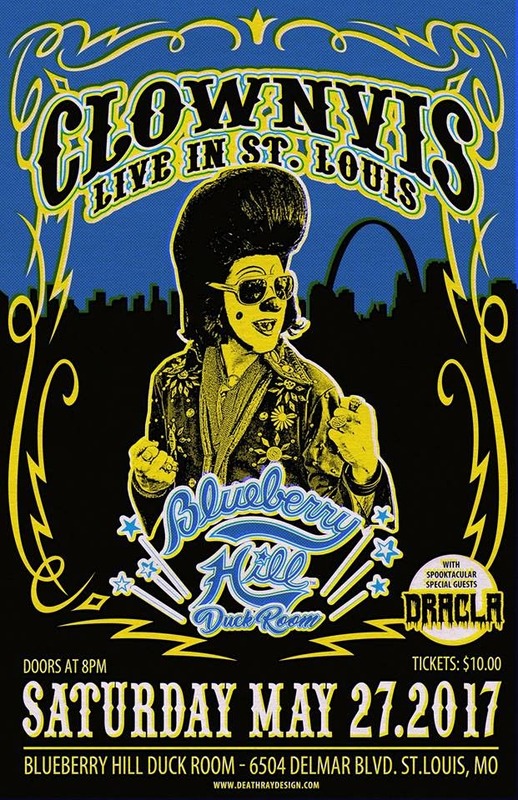 Later that night me and the guys went to see my role model Clownvis Presley, King of Clowns in the Duck Room at Blueberry Hill. The opener Dracla was really good. The lead singer stayed in character hilariously. Once or twice while the crowd was cheering he yelled "silence!". Once he quipped that "the next song is an oldie, it's 500 years old." Clownvis did his thing and won the hearts and minds of every last person in attendance. He promised to Teen Wolf the Loop Trolley upon its completion. Sometimes at night when the wind whistles through the trees I swear I can hear a faint "Clownvis".